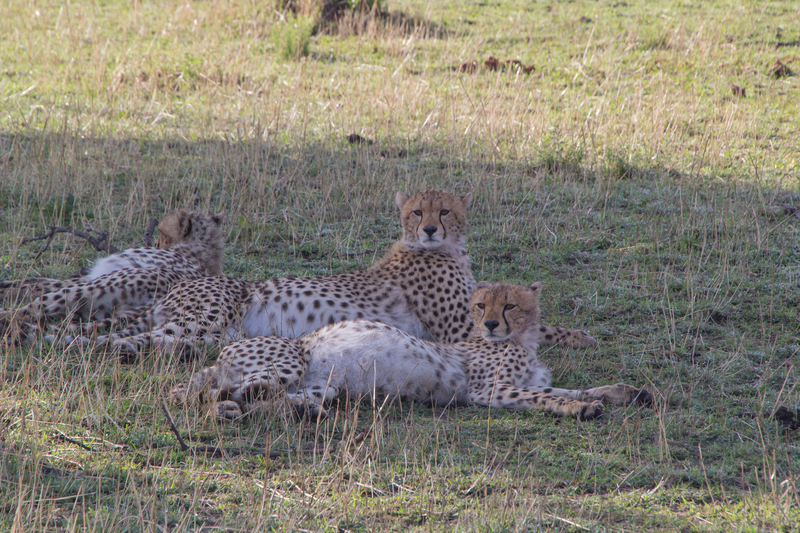 We headed out a little late, later than we were expecting, but it was nice to have some time to sleep in. We got on the road around 8am. 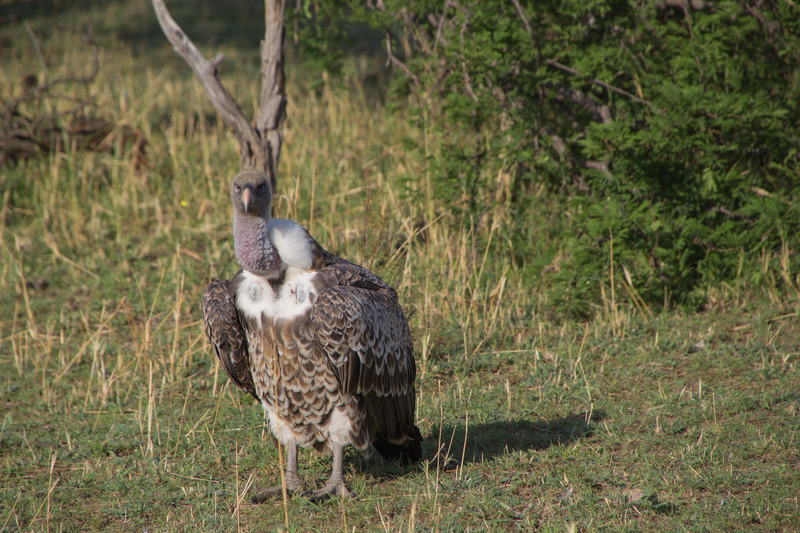 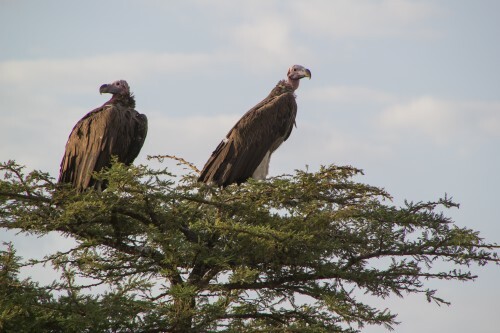 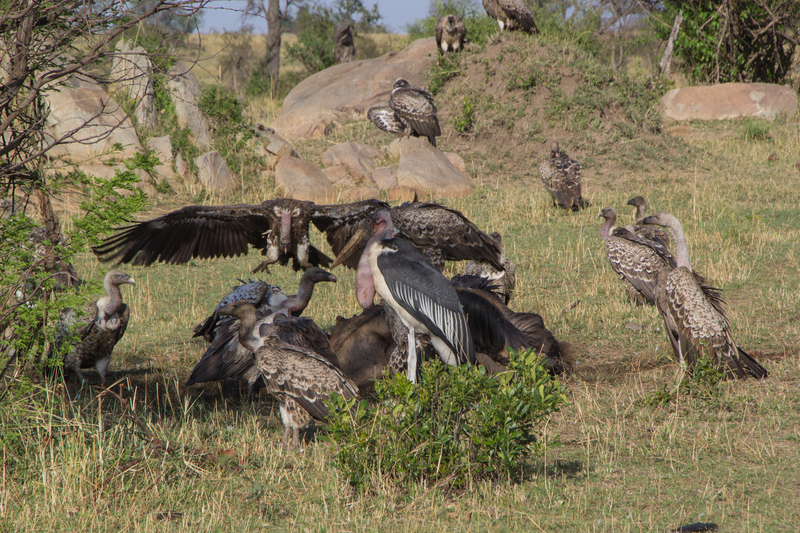 Immediately after leaving camp, we came upon a big group of vultures and storks chowing down on a downed wildebeest. 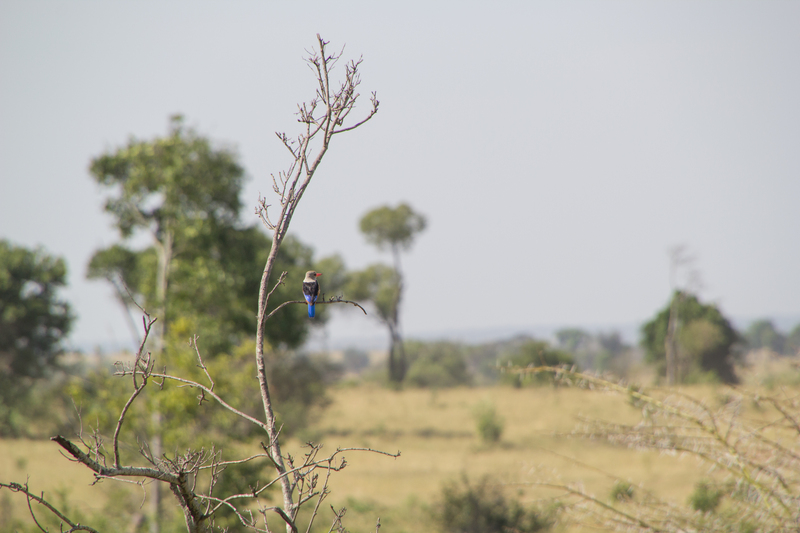 We sat and watched for awhile, then went on our way. 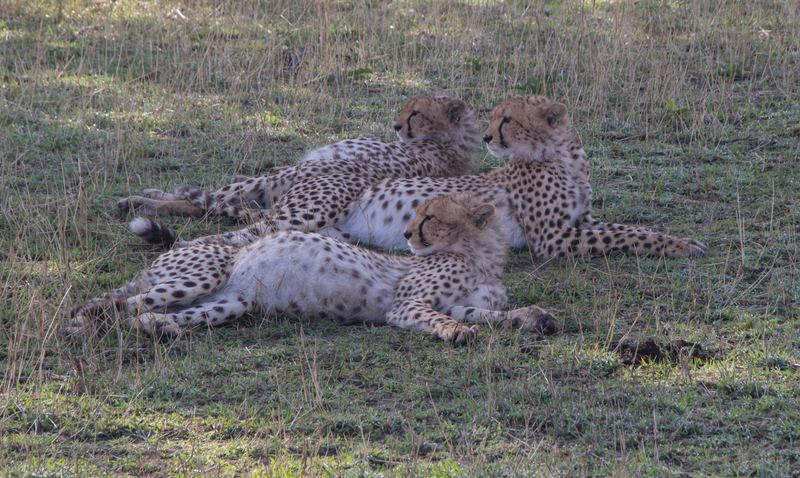 It was only about five minutes until we came upon three orphaned cheetahs that were absolutely stuffed. 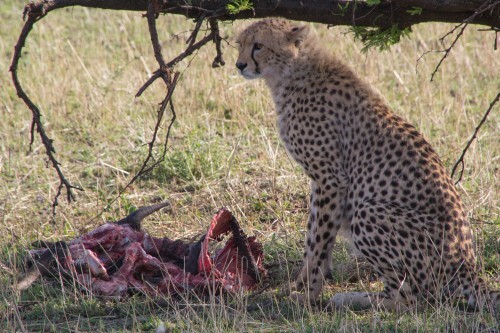 Apparently our guide Medison and the other folks in the truck had seen the cheetahs bring down a small wildebeest the afternoon before, while we were on our way to camp from the airport. 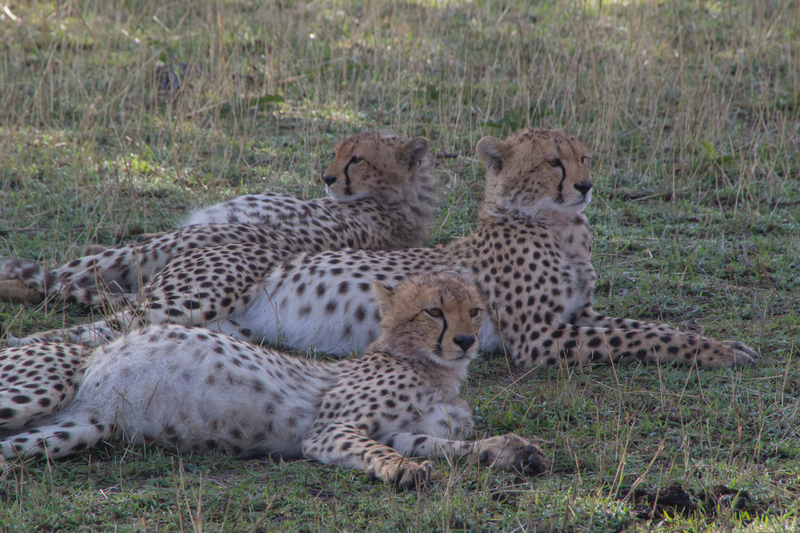 They were just watching the cheetahs, and when they got up, one of the tourists half-jokingly asked "are they going to hunt the wildebeest?" 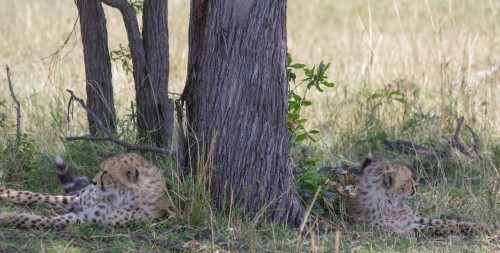 Well, they did, and they got it. We saw the aftermath. 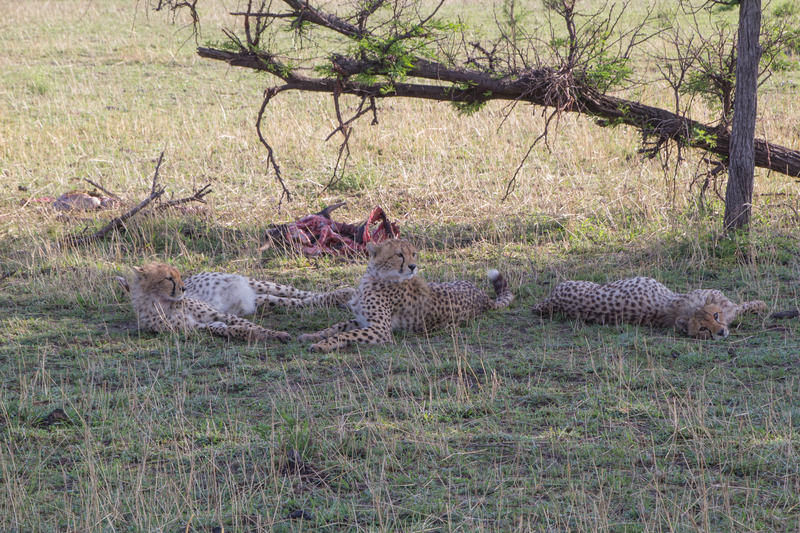 And they weren't going anywhere, not with the stomachs they had. 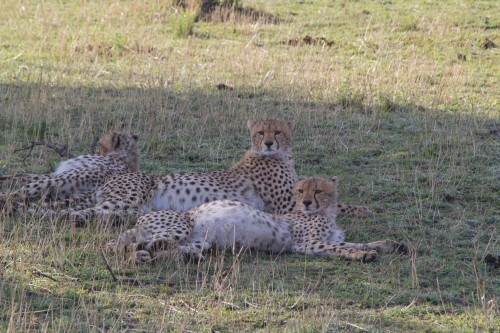 The three cheetahs also explained why we saw a group of 3 people at dinner the night before, and breakfast today. 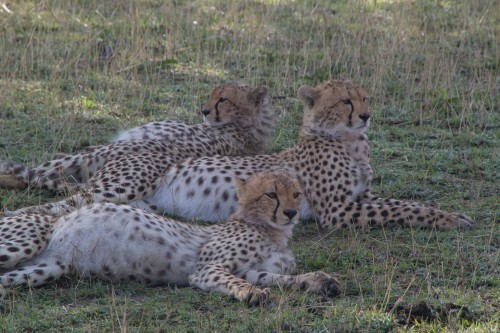 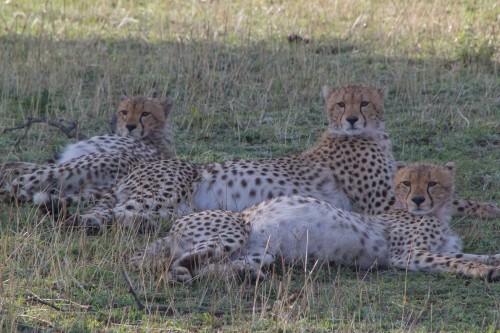 The group was actually 4 people, but the fourth person freaked out when she saw the cheetahs killing and eating the wildebeest the day before. The people in our truck could see/hear her flipping out, as apparently she yelled at everyone in both trucks to stop laughing (no one was laughing), started crying hysterically, and was apparently considering leaving the trip altogether. 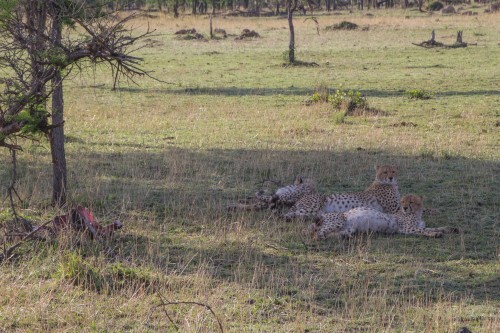 We wished we could have traded places with her the day before - everyone would have been happier. 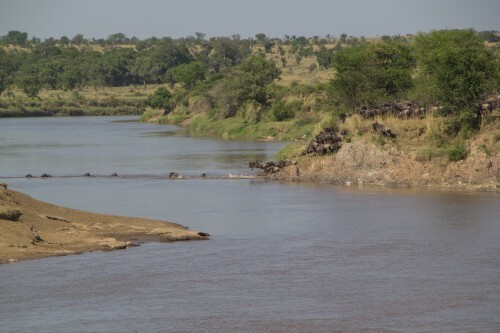 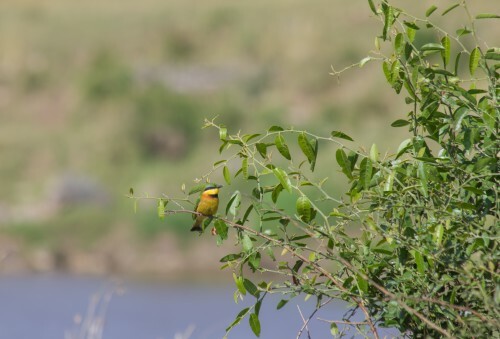 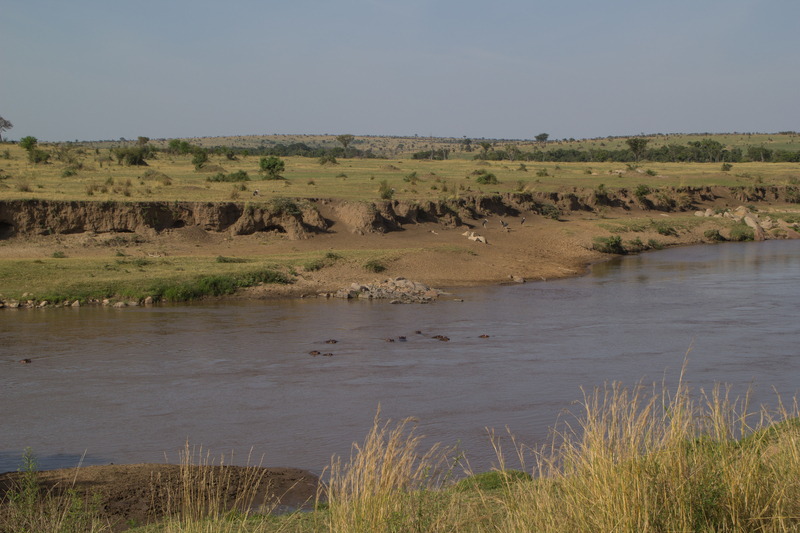 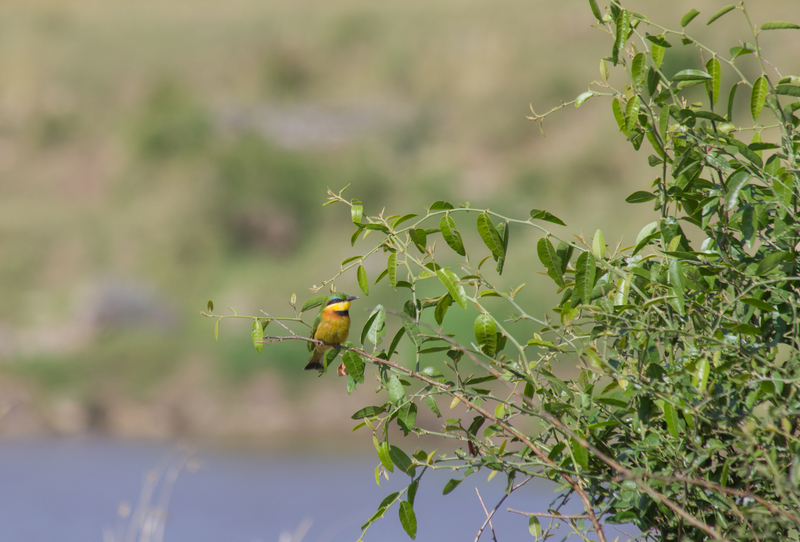 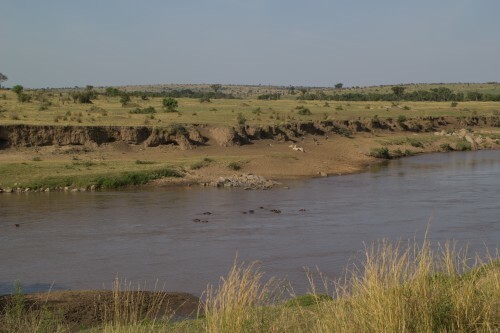 Our main purpose of the morning was to see some Wildebeest river crossings, so after leaving the cheetahs we made our way over towards the river bank, looking to see what groups of Wildebeest looked likely to cross. 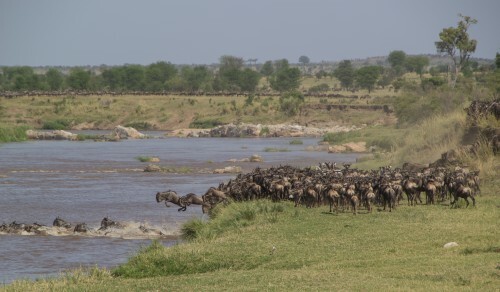 They are one big group for purposes of the migration, but seemed to be in numerous smaller groups for walking around and grazing from day to day. We saw a couple groups that looked like they were starting to head towards the river, but they were a bit indecisive - apparently that is par for the course. 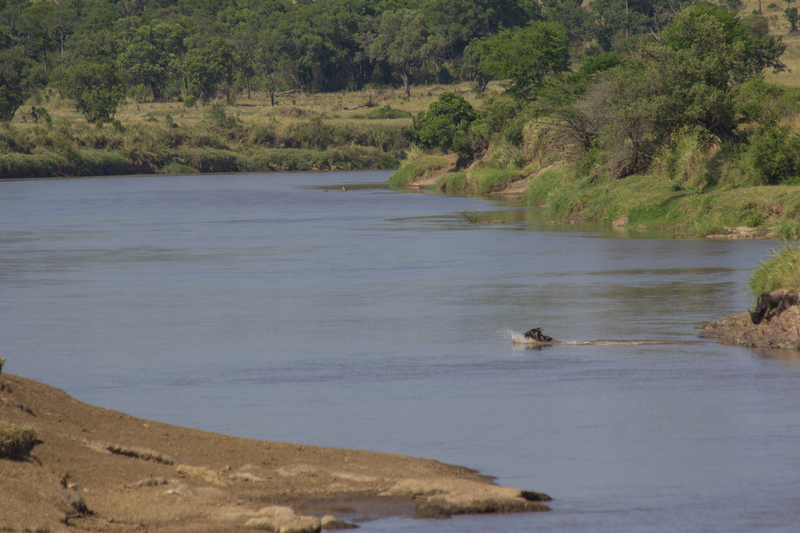 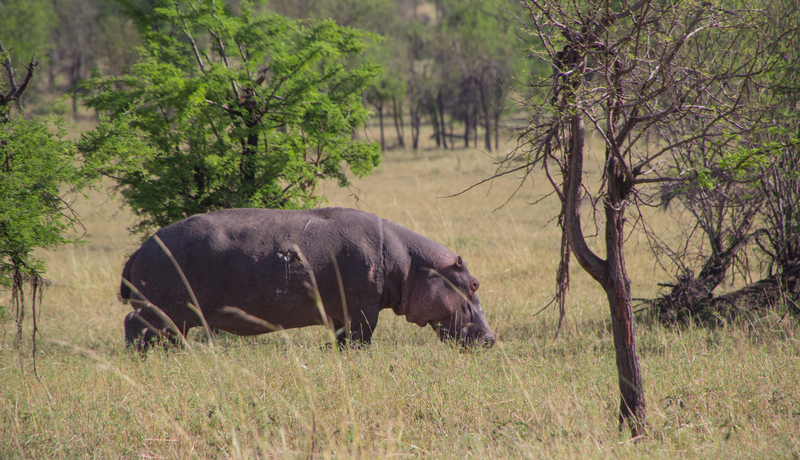 While waiting for them to do something, we spotted a large hippo heading back to the water. Hippos graze at night, and walk long distances from the river to graze. 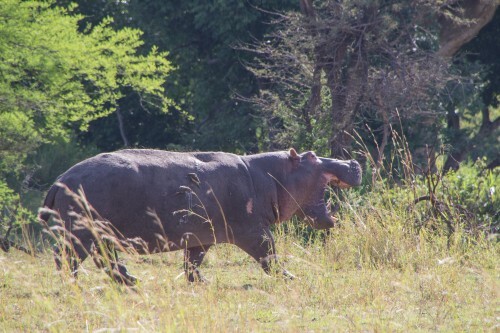 This one had presumably got a late start heading back, as usually hippos are back in the water by sunrise. 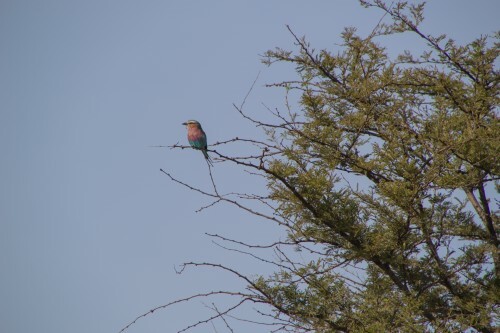 We also saw a number of lilac-breasted rollers and some kingfishers flying around. 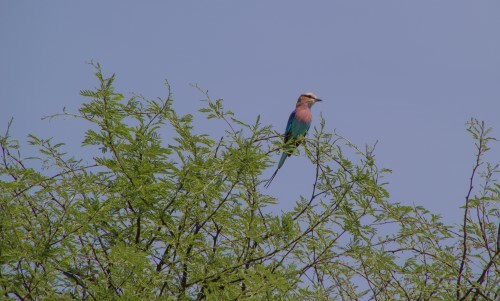 They each have very bright colors that make them hard to miss. There were a couple of warthogs also, but they seemed much more shy than the ones we had seen in Botswana, as they kept running away whenever the trucks came anywhere close. 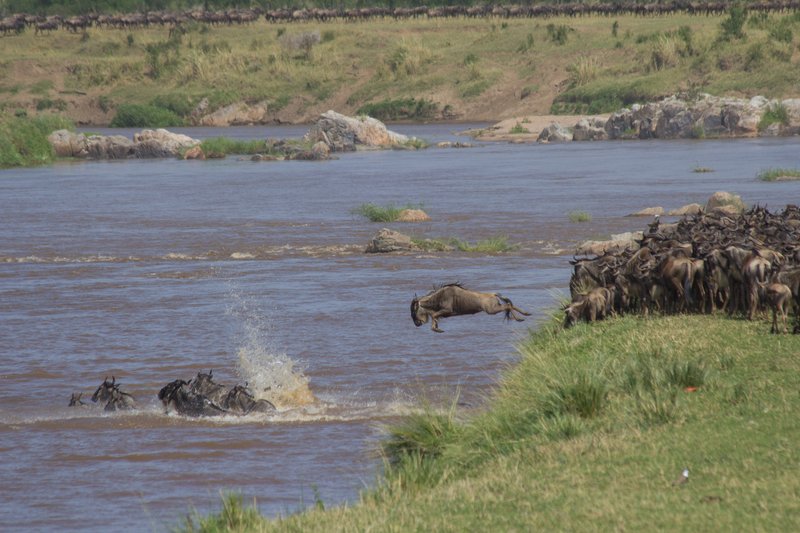 We had several false starts on the river crossings before we finally saw one. Understandably, no individual animal wanted to be the first to hop into the crocodile infested waters to swim across. 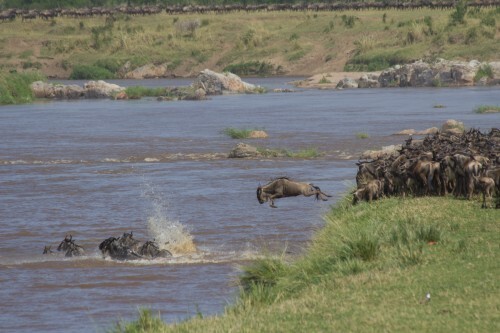 Eventually we saw one crossing, and it was exactly like they show in the nature shows, with animals jumping into the water one after the other. 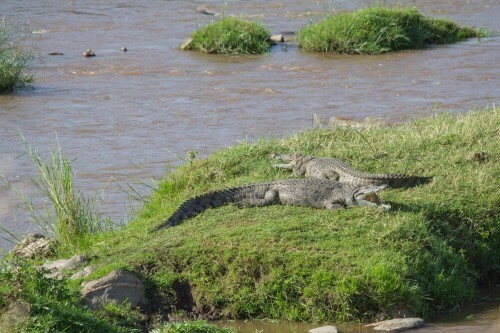 In this case, however, there were no crocodile attacks, as Medison told us they were likely not hungry. 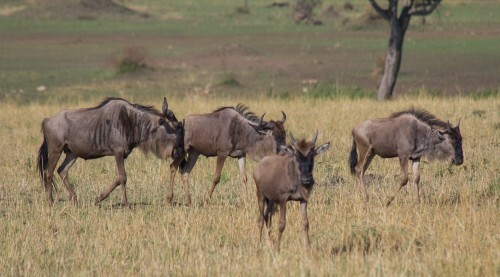 The wildebeest had showed up in the area a little early this year, as the rains came early. 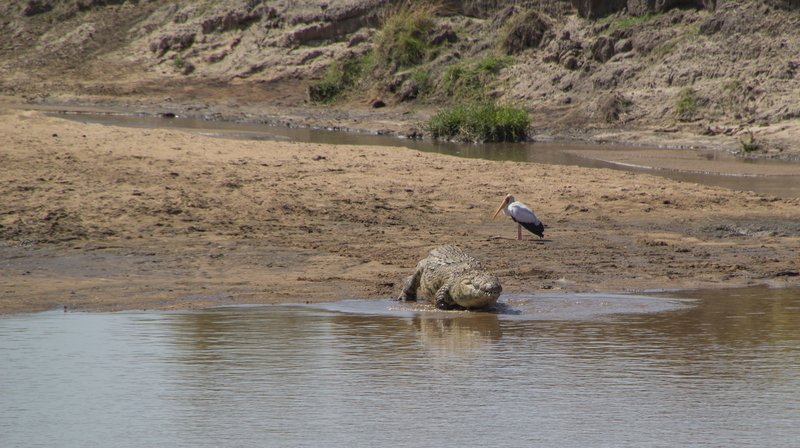 Because of that, the crocodiles had already been feeding for over a month. 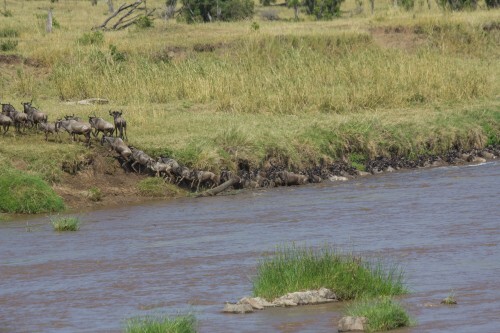 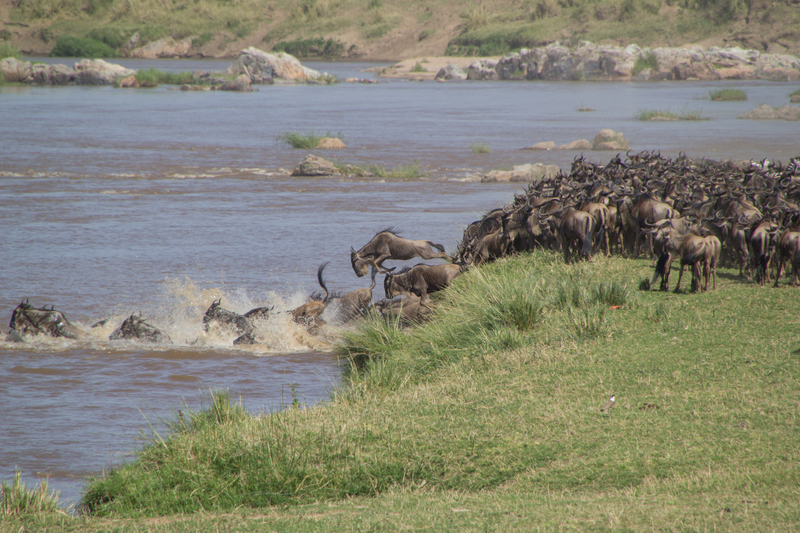 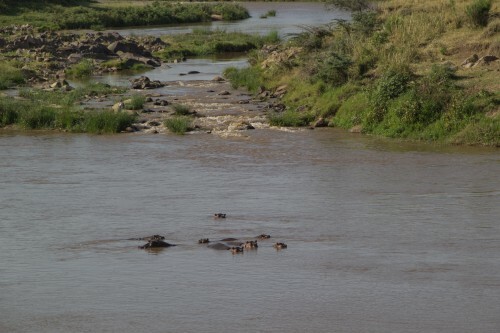 Most of the Wildebeest happily walked out the far bank, but we did see some that had been separated from their children or parents and swam back across, tempting fate for a second time. 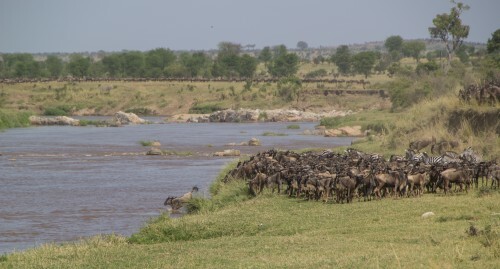 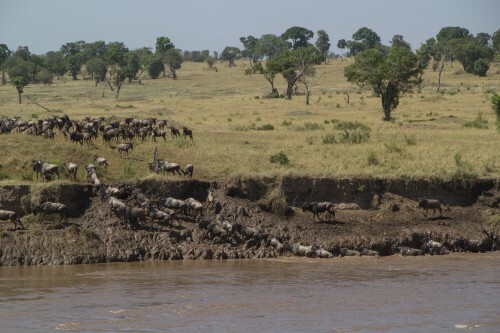 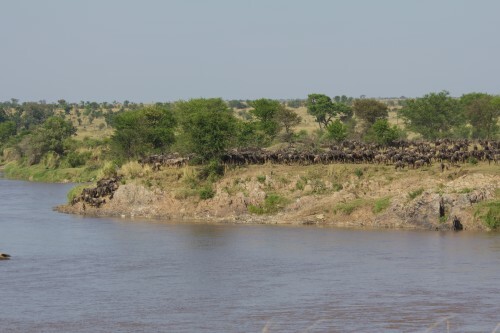 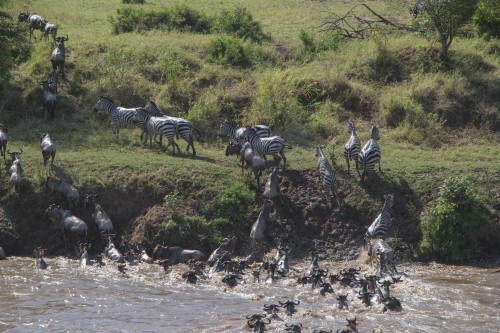 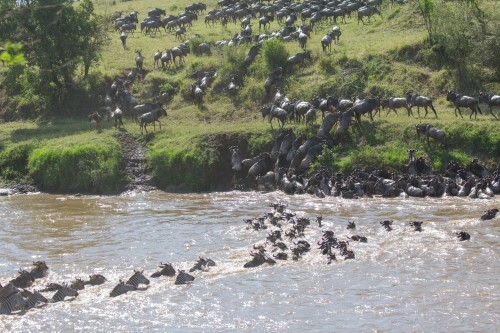 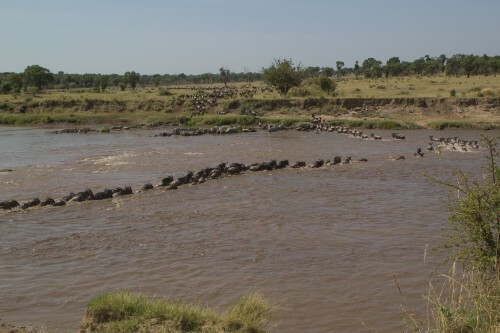 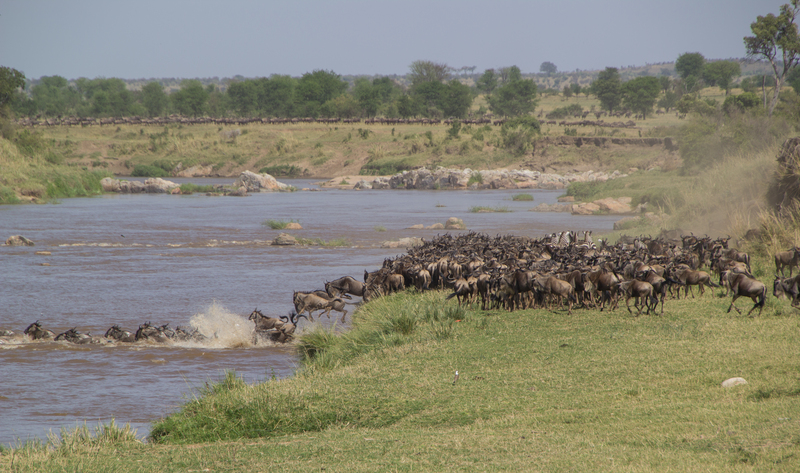 We had always thought that the Wildebeest stayed south of the river for as long as possible, then crossed the river as one big group and then stayed north of the river. But the truth is that they aren't particularly smart and they cross back and forth depending on whatever grass happens to look greener on any given day. 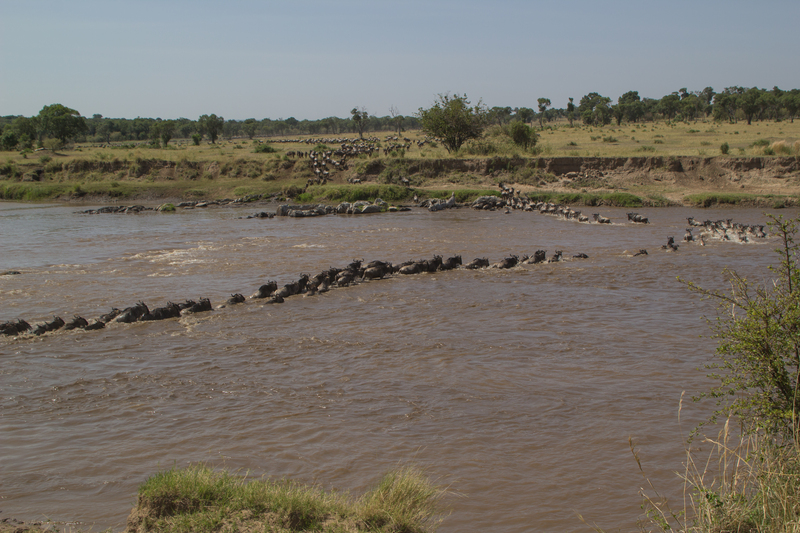 We saw three separate crossings, all near one another. 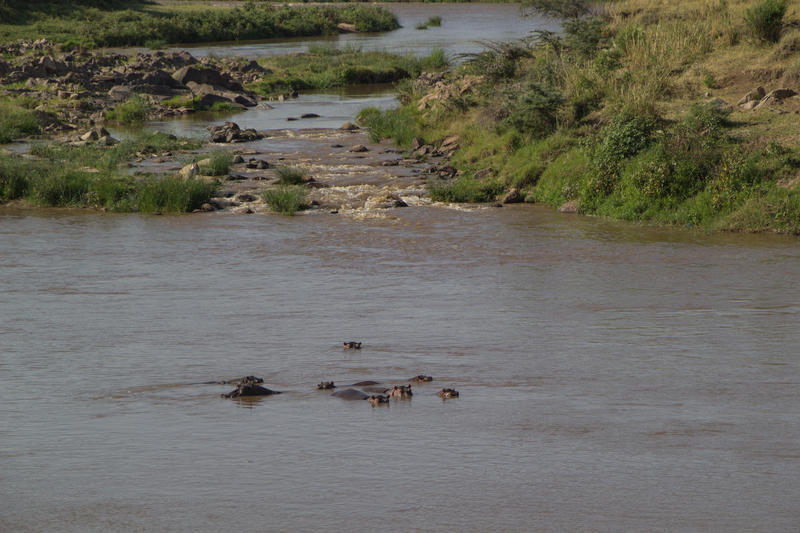 As far as we could tell, no one got attacked and no one drowned. 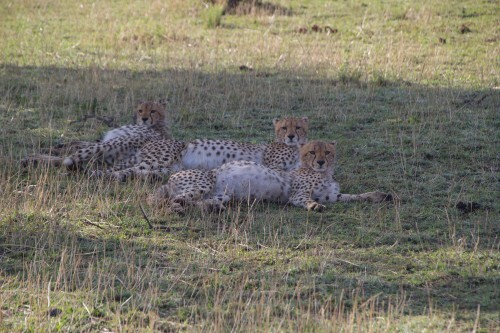 After seeing these, we headed off to see what else was around the area before heading back for lunch. The cheetah cubs had moved a bit, but were still in the same general vicinity as a few hours earlier. 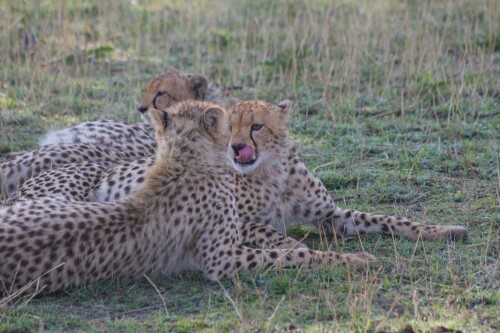 We got back right at noon, and noted that we had already taken almost 400 pictures for the day. 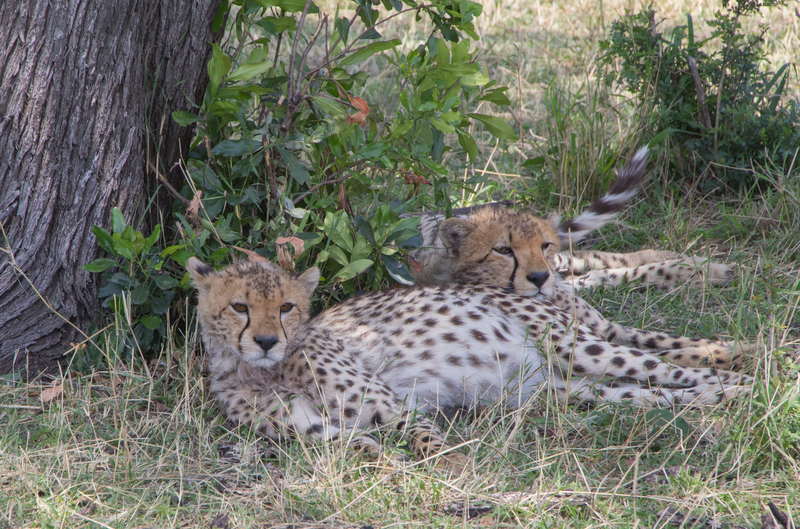 After lunch, we a little reading and took a nap. 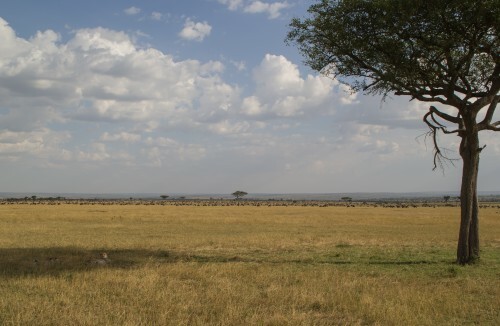 We tried to see what was going on in the world by using the camp's wi-fi, but it was very slow. 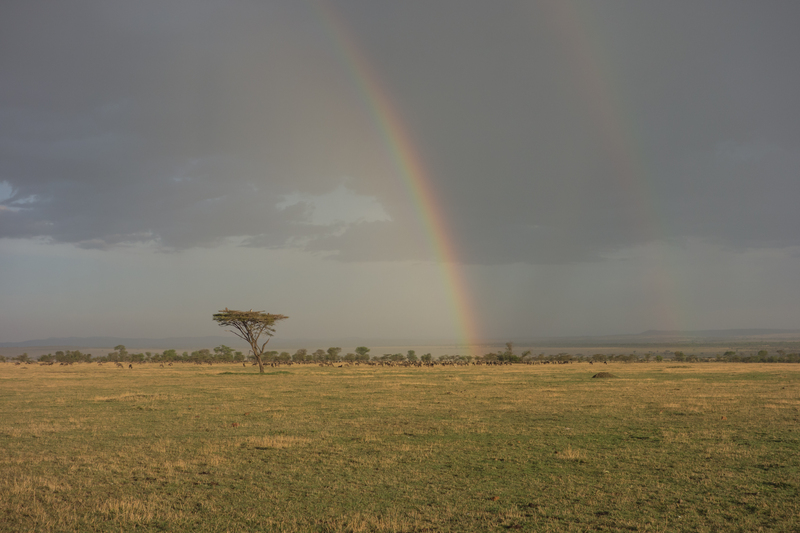 This was no surprise, and we had no complaints. 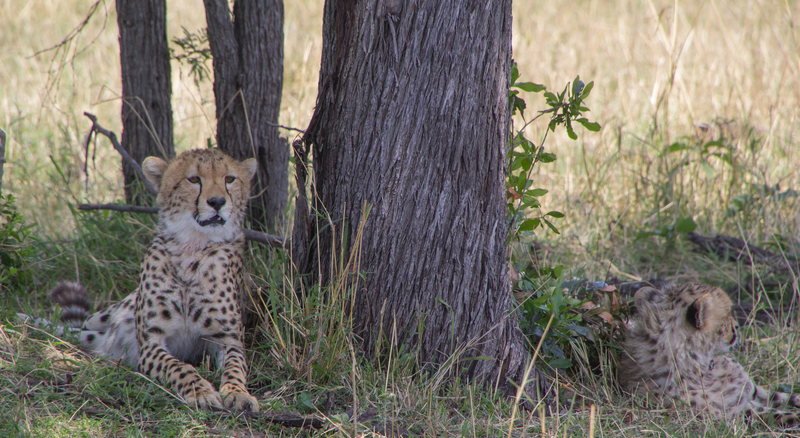 In the afternoon, we went searching for cats. The other guests in the truck wanted to see lions and/or leopards. 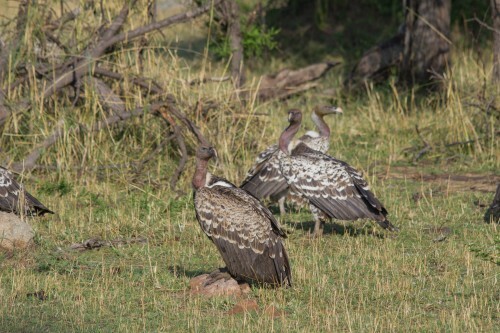 We did too, but our understanding was that there weren't that many in the area, and that this might be a wild goose chase. After awhile, we did see some cats, but not lions or leopards. 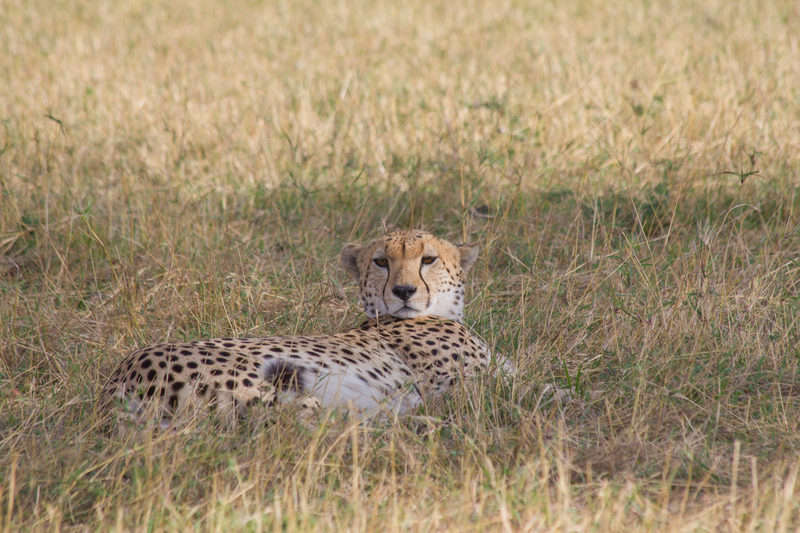 We saw two adult male cheetahs hanging out in the shade, waiting for the sun to go down. 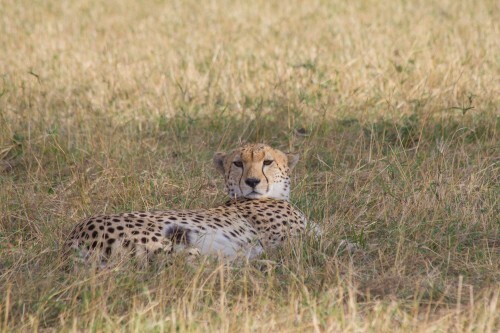 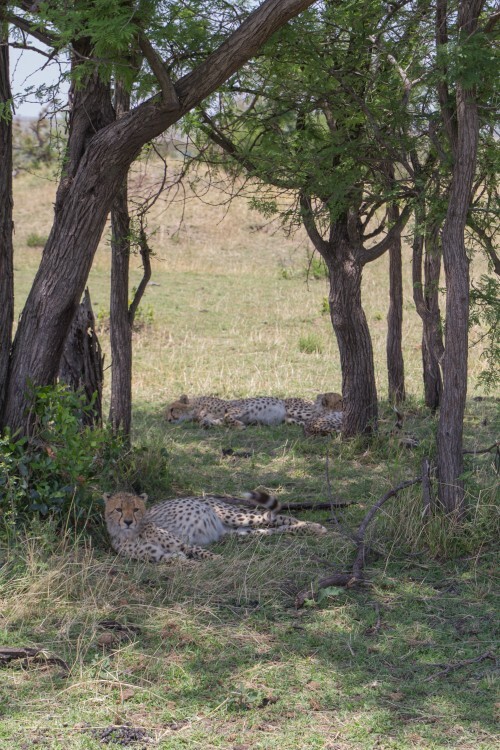 It was actually pretty easy to determine that there were predators where we found the cheetahs, as there were animals grazing everywhere, with a conspicuous large circle of nothing for about 500 meters in all directions from the tree where we found the cheetahs. 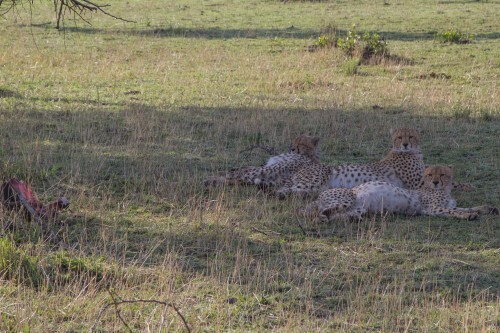 Medison told us that these "empty circles" are a common way to find predators. 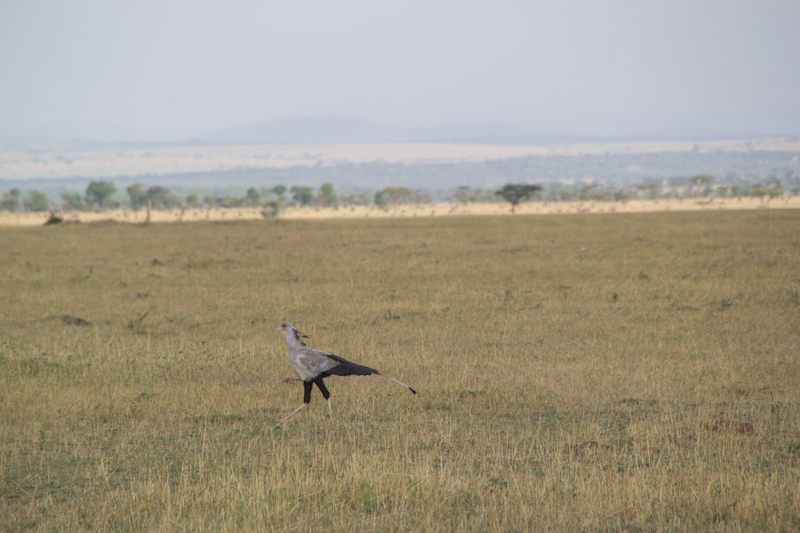 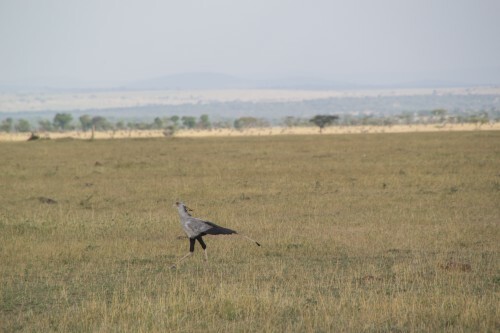 In addition to the cheetahs, we also saw a secretary bird, a jackal, some ostrich and a handful of water buffalo. 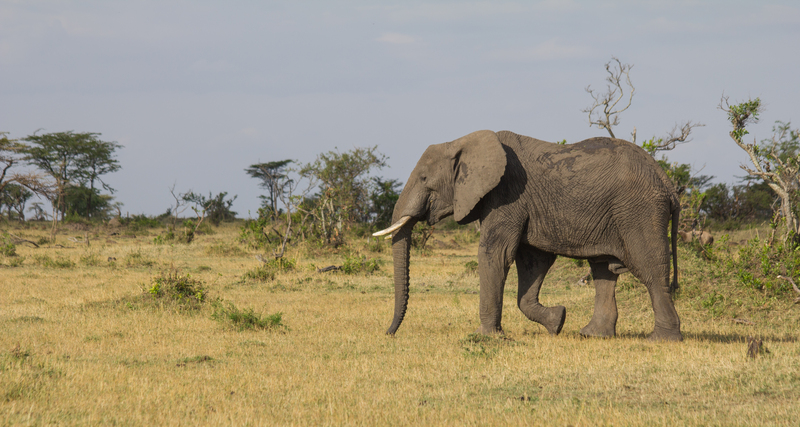 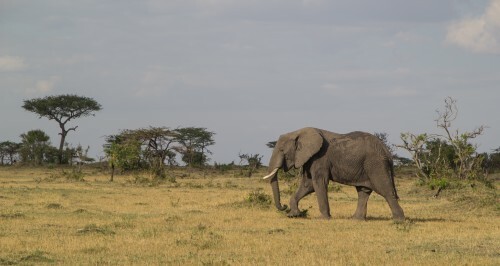 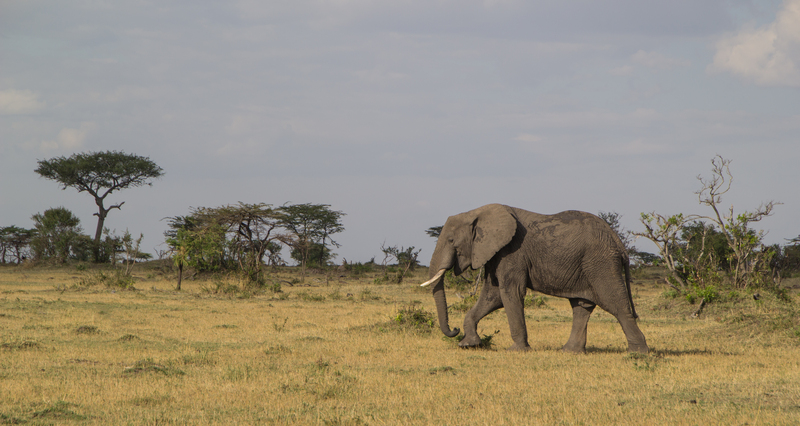 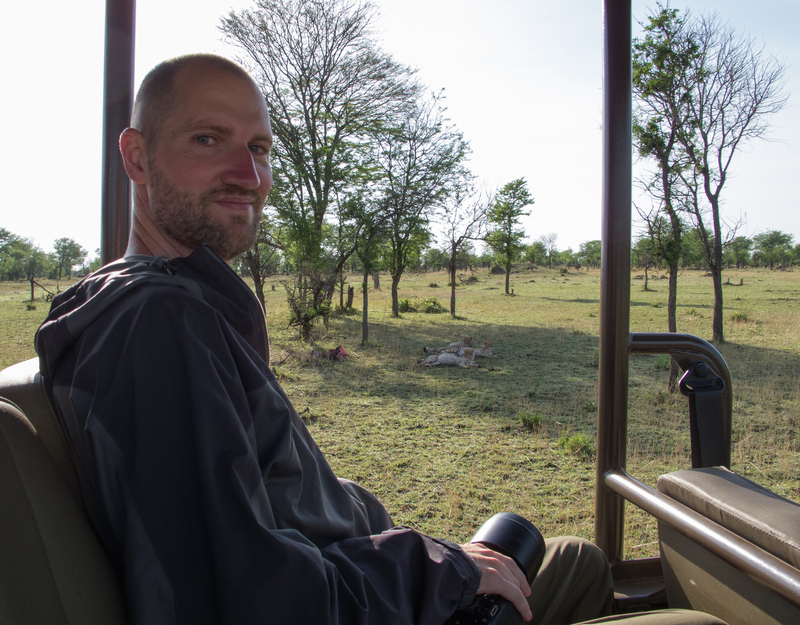 We would have liked to stop and get some shots, but Medison was pushing ahead trying to find the lions and leopards. 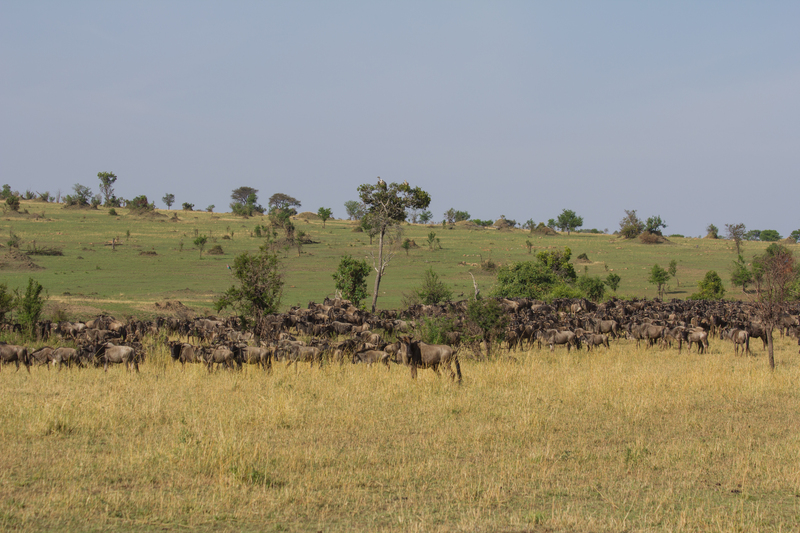 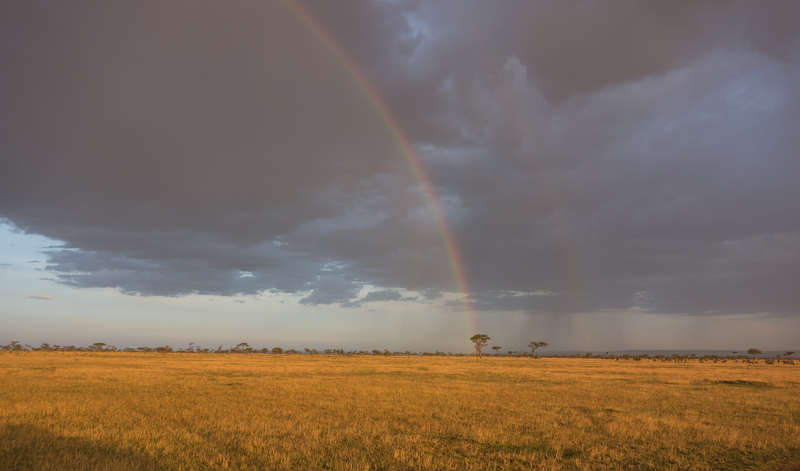 We went pretty far north, almost to the Kenyan border, at which point there were hardly any wildebeest, and a lot more impala. 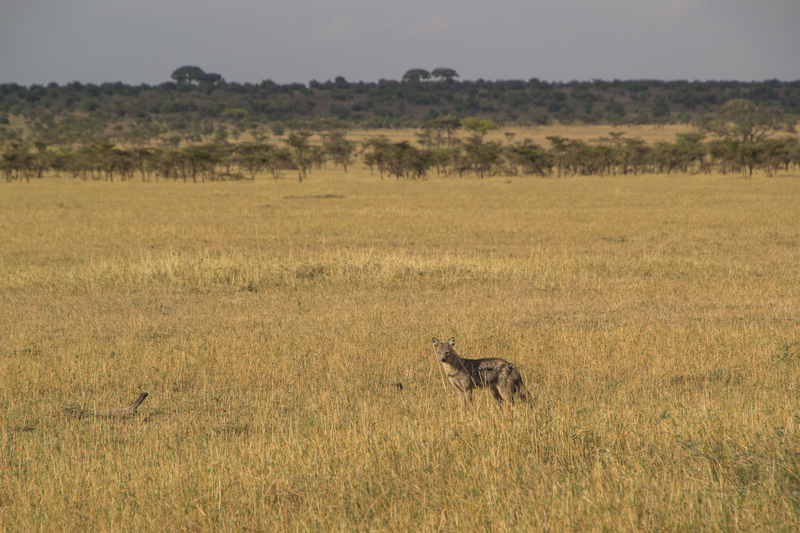 The impala were running, seemingly for fun as opposed to being chased, and they were fast. 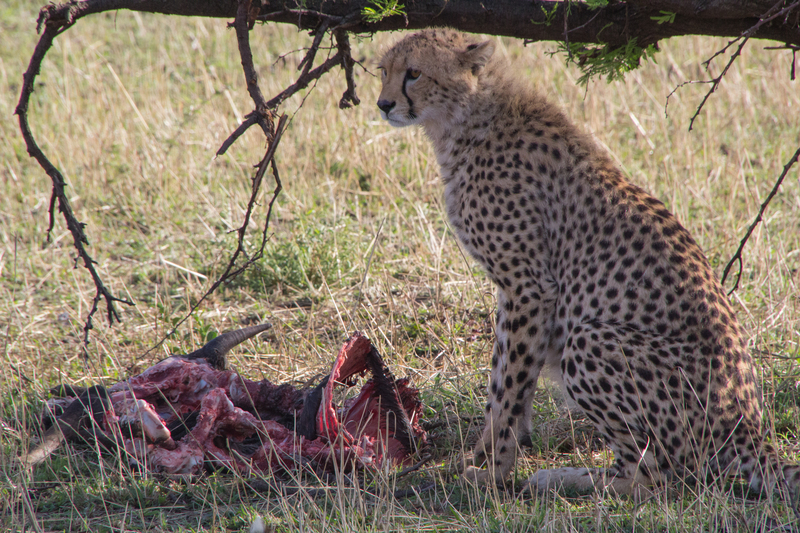 It would be amazing - if we were ever lucky enough to see it - to watch a cheetah chase an impala. Maybe one of these years. 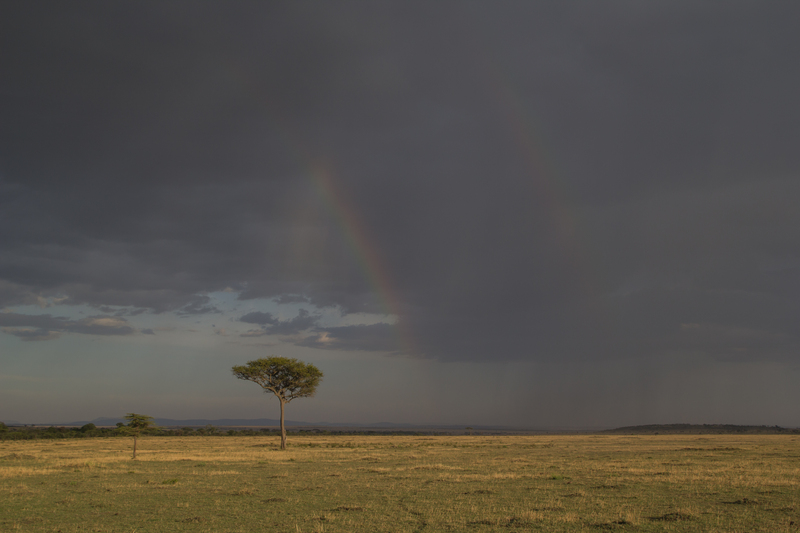 We could see dark skies heading in from the east, with a huge rainbow (and then a double rainbow). Unfortunately that turned into rain coming from the east. 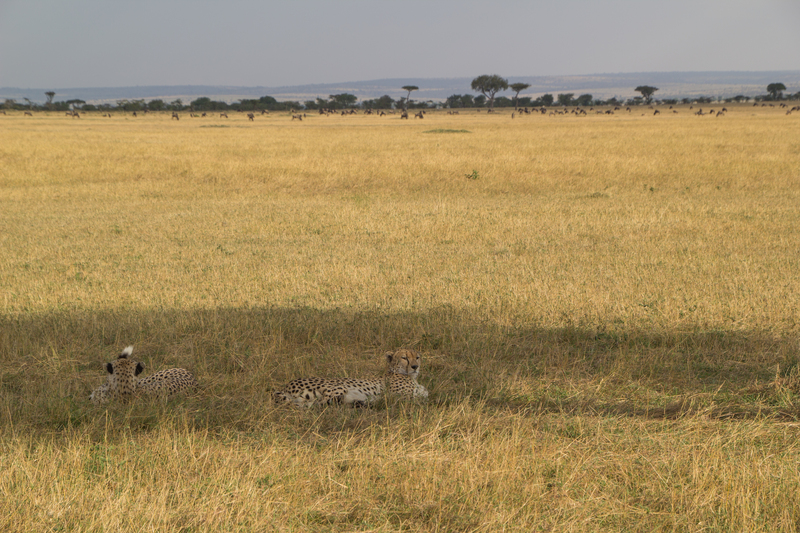 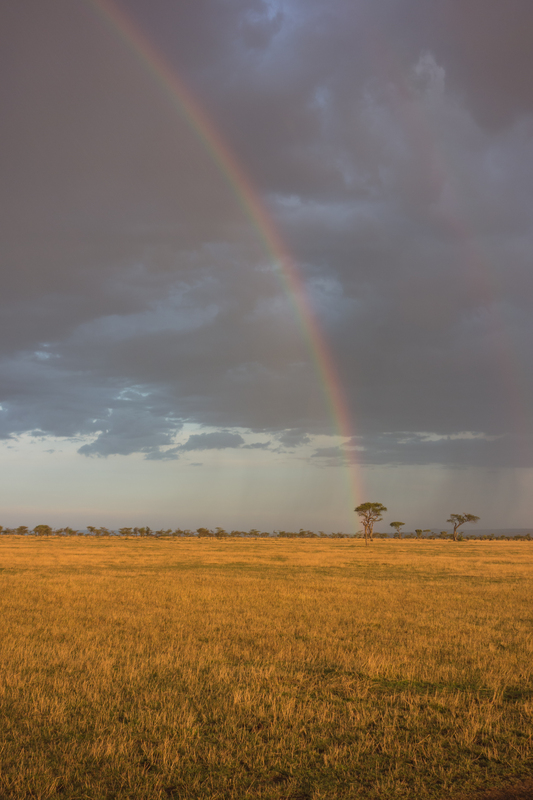 After awhile, we came back to the cheetahs, and they looked ready to hunt, but they didn't seem to want to hunt in the rain, so we started back towards camp. 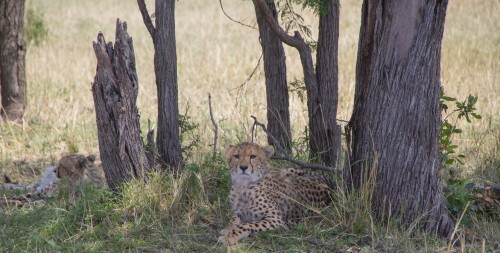 On the drive back to camp, we saw the 3 other, juvenile cheetahs once more. 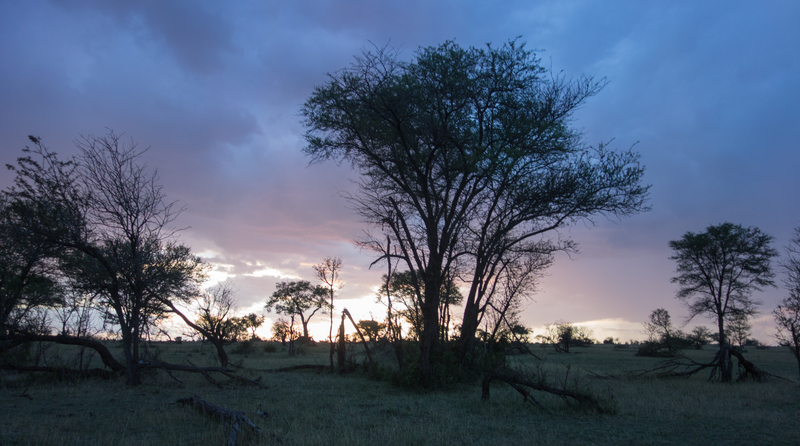 It was dark when we got back. 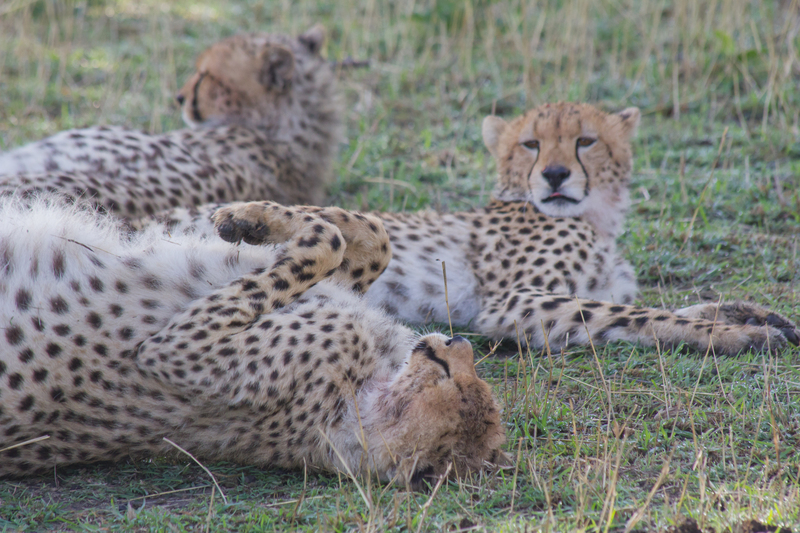 We got cleaned up, and then had a later dinner. 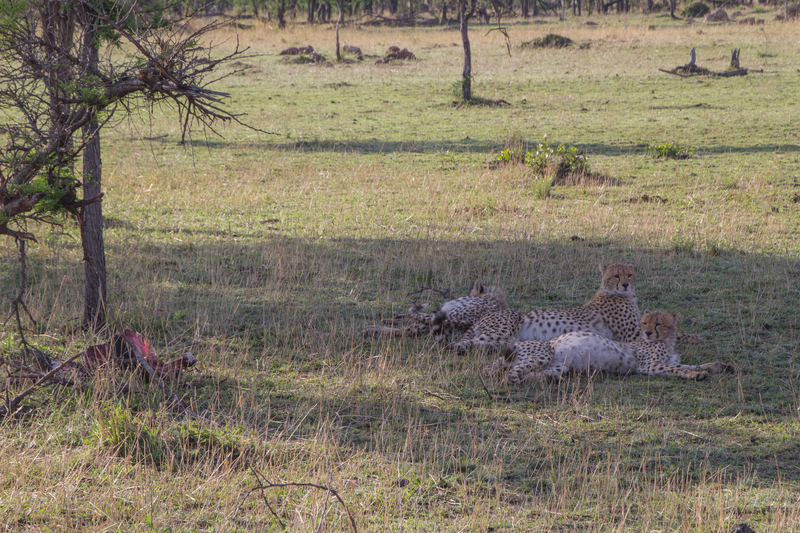 We were the last ones there, and fortunately no one was in a hurry to get rid of us. 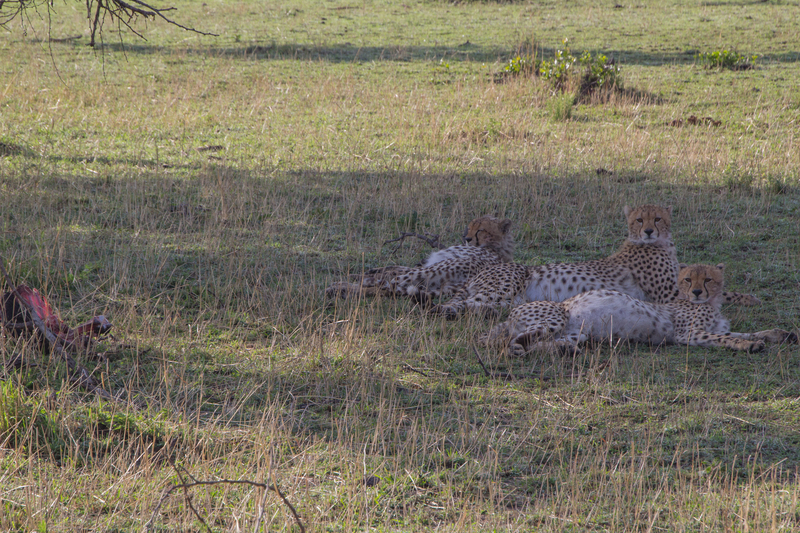 It was nice to be able to have drinks again, not having to worry about getting dehydrated for a hike.